We had a huge week of giveaways last week to co-incide with our fourth birthday – and the team from Sony certainly came to the party with this awesome pop package. 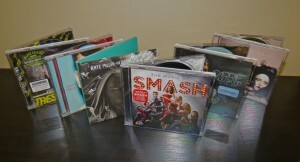 Included are copies of Adam Lambert’s new album ‘Trespassing’, Carrie Underwood’s ‘Blown Away’, Kate Miller-Heidke’s new album ‘Nightflight’, Rebecca Ferguson’s ‘Heaven’, the ‘Smash’ soundtrack and The Gossip’s new LP ‘A Joyful Noise’. Jason from Applecross in Western Australia! Congratulations Jason, a bulging packet will be arriving in your hot little hands shortly! Thanks ever so to all our entrants for their passion for this little package – and to our friends at Sony Music for providing it to us!